HM Coastguard was called at just after 8am this morning (Sunday) to a report of the Red Falcon ferry colliding with yachts in East Cowes and then running aground. The incident sparked a search and rescue mission after reports of cries for help from neighbouring boats were reported. It’s just weeks since the last incident in the area area during thick fog, when the Red Eagle ploughed through moorings. Just after 8am today (Sunday 21 October) HM Coastguard received reports that the Red Falcon Ferry had collided with at least two yachts whilst trying to berth at the entrance of Cowes Harbour during heavy fog. At around the same time we received a 999 call from a member of the public reporting that he’d heard cries for help within Cowes Harbour. We are currently carrying at an extensive search of the area with Cowes RNLI lifeboat, Calshot RNLI lifeboats and Coastguard Rescue Teams from Bembridge, Needles and Ventnor. A Coastguard search and rescue helicopter was searching the area but due to the low visibility in the area had to turn back. The ferry with 56 persons onboard remains grounded at the entrance at Cowes. Those persons onboard are safe and well. Red Funnel suspended their vehicle ferry service as well as the Red Jet service due to the harbour being closed. They have been tweeting updates. Red Jet suspended until further notice due to the Harbour in Cowes being closed due to safety reasons. Our next update will be at 13:00. “The 07.00 vehicle ferry sailing from Southampton to East Cowes came into contact with several small yachts whilst entering Cowes Harbour at 08.00 this morning (21/10/18) in dense fog, The ship (Red Falcon) is currently aground but is watertight and no injuries have been sustained to any of the 40 passengers on-board. “There are no reports of any injuries to anyone who was involved in the incident. “Attempts to refloat the vessel are currently underway on a falling tide. If this proves unsuccessful, a further attempt will be made at the next High Tide. 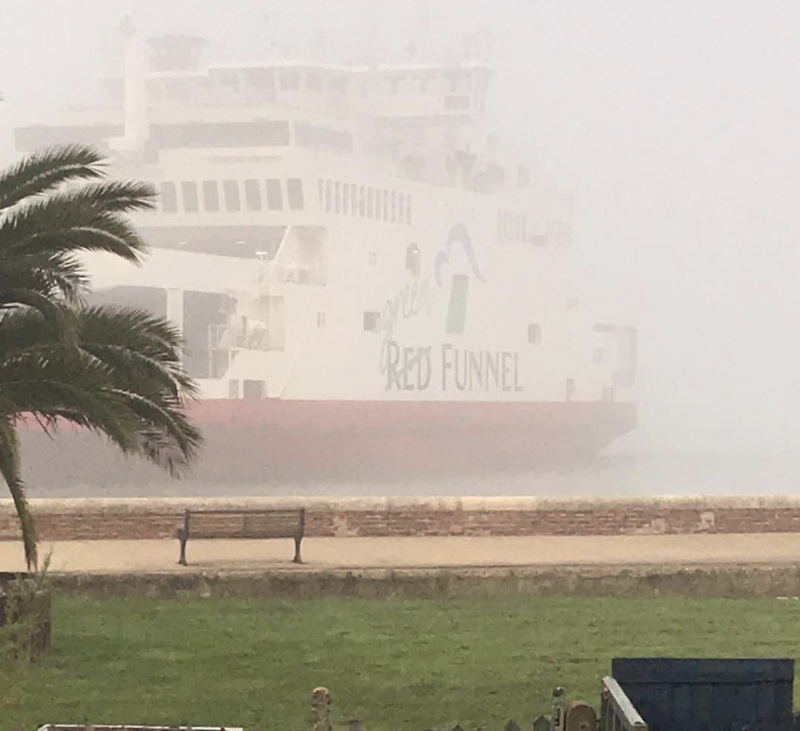 “Red Falcon, the ferry involved in the grounding incident in East Cowes this morning in dense fog has now been refloated and is safely alongside. “Passengers and vehicles are currently being discharged at East Cowes. This ship will now be subject to a detailed inspection and is not expected to return to service today. A revised vehicle ferry timetable will operate between Southampton and East Cowes. Our staff are contacting customers booked to travel today to offer them alternative sailings. Red Funnel’s Southampton-West Cowes Red Jet service is unaffected and foot passengers who normally travel via East Cowes are advised to use this service. 6 Comments on "Red Funnel ferry involved (again) in yacht collision"
Suppose the fixed link brigade will love this incident! For anyone campaigning for a fixed link what ISN’T there to love about the story? Red Funnel runs into another bunch of boats, then grounds the ferry for good measure. Ya don’t see tunnels pulling that sort of stunt! That’s because accidents on roads tend to block a tunnel or access roads to it for 8-12 hours. Oh yes, and are often fatal. Who do you think left the boats there? Collision Regulations require that a good lookout is maintained at all times. In fog that means don’t rely on radar to detect sailing or other vessels, moored or underway, that do not have radar reflectors fitted. Mk 1 Eyeballs are required preferably at the vessel bow in the direction of travel. Using my android phone and google maps I can pinpoint my position to within 20 yards. Maybe the skipper needs to upgrade! !